We are constantly looking to grow our course offerings. If there’s something you’d like we don’t offer, drop us an email! 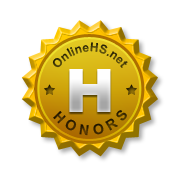 English, Math, Science ANY student enrolled in an eligible course may select the Honors Distinction. In order to qualify for Honors Distinction and have it noted on the official transcript, a student MUST complete all the supplementary requirements in addition to all the regular course assignments. To achieve the Honors Distinction a student must demonstrate advanced outcomes beyond that of the regular course. Supplementary requirements are denoted within the course by the Honors Distinction ICON. These additional assignments are designed to be differentiated for advanced learners to support college readiness or complexity above the standard level assignments and are developed as an integral component of the program of study for advanced learners. The supplementary assignments are designed to be more challenging and rigorous than standard level assignments in order to foster growth for advanced learners distinguished by a difference in the depth and scope of work required. ENG101/151 Freshman English 101 Ninth grade marks the beginning of many important transitions, including the experience of becoming an adult. In this unit, you will explore the theme of coming of age and examine how writers in a variety of texts use stylistic choices to create the voices of characters who are going through life-changing experiences. Along the way, you will study texts independently, conduct interviews, analyze arguments regarding the value of postsecondary education, and examine the complex relationship between an author’s purpose, his or her audience, and the ways in which he or she appeals to readers. By the end of the unit, your academic coming of age will be marked by a heightened understanding of voice, appeals, and persuasive techniques. ENG102/152 Freshman English 102 In this year-long course, you will investigate the thematic concept of coming of age. Throughout this course, you will read Harper Lee’s novel “To Kill a Mockingbird”, informational articles about college; short stories by Poe and Collier; historical articles about segregation; poetry by Wordsworth, Neruda, and Cardiff; and Shakespeare’s “Romeo and Juliet”. From your readings, you will gather evidence from texts and incorporate it in written and oral responses, including a presentation using multiple forms of media. You will encounter more varied and complex writing in this grade as you write in a variety of modes including argumentative, informational, and narrative writing. ENG201/251 Sophomore English 201 In this year-long course, you will explore the thematic concept of culture. Texts include Chinua Achebe’s “Things Fall Apart”, Sophocles’ “Antigone”, Susan B. Anthony’s “On Women’s Right to Vote,” and the Nobel Prize acceptance speeches of Alexander Solzhenitsyn and Elie Wiesel. You will be challenged to use evidence from these texts in both your written and oral responses. You will study the extent to which one’s culture influences one’s worldview, and incorporate textual evidence in a written argument. Research plays a role as you investigate the Ibo culture represented in “Things Fall Apart” and present your findings in a presentation with digital media. Film texts play a role when you analyze the degree of objectivity and subjectivity present in documentary films while also gathering evidence about environmental issues. ANY student enrolled in this course may select the Honors Distinction. In order to qualify for Honors Distinction and have it noted on the official transcript, a student MUST complete all the supplementary requirements in addition to all the regular course assignments. ENG202/252 Sophomore English 202 In this year-long course, you will explore the thematic concept of culture. Texts include Chinua Achebe’s “Things Fall Apart”, Sophocles’ “Antigone”, Susan B. Anthony’s “On Women’s Right to Vote,” and the Nobel Prize acceptance speeches of Alexander Solzhenitsyn and Elie Wiesel. You will be challenged to use evidence from these texts in both your written and oral responses. For example, you will study the extent to which one’s culture influences one’s worldview, and incorporate textual evidence in a written argument. Research plays a role as you investigate the Ibo culture represented in “Things Fall Apart” and present your findings in a presentation with digital media. Film texts play a role when you analyze the degree of objectivity and subjectivity present in documentary films while also gathering evidence about environmental issues. ENG301/351 Junior English 301 In this year-long course, you will explore the concept of the American Dream. You will read foundational U.S. documents such as Lincoln’s Second Inaugural Address and The Declaration of Independence, essays by Thoreau and Emerson, poetry by Hughes and Whitman, Arthur Miller’s drama “The Crucible”, and Zora Neale Hurston’s “Their Eyes Were Watching God”. These texts will help you gather evidence to incorporate in an informative essay defining what it means to be an American and a synthesis essay that argues whether or not America still provides access to the American Dream. You will compare both print and film versions of “The Crucible”. ANY student enrolled in this course may select the Honors Distinction. In order to qualify for Honors Distinction and have it noted on the official transcript, a student MUST complete all the supplementary requirements in addition to all the regular course assignments. ENG302/352 Junior English 302 During this year-long course, you will explore the concept of the American Dream. You will read foundational U.S. documents such as Lincoln’s Second Inaugural Address and The Declaration of Independence, essays by Thoreau and Emerson, poetry by Hughes and Whitman, Arthur Miller’s drama “The Crucible”, and Zora Neale Hurston’s “Their Eyes Were Watching God”. These texts will help you gather evidence to incorporate into an informative essay defining what it means to be an American and a synthesis essay that argues whether or not America still provides access to the American Dream. You will compare both print and film versions of “The Crucible”, and study various features of news outlets while working to create your own news outlet. ENG401/402 Senior English 401 This semester-long course capitalizes on the confidence and expertise you have gained as interpreters and analyzers of texts by introducing you to multiple lenses through which to view text. You are asked to broaden your understanding and your interpretive skills by thinking deeply about themes and ideas from multiple perspectives. You will craft argumentative and explanatory essays using the writing process to create clear and coherent pieces. You will use research, cite evidence, evaluate, and analyze informational text. You will incorporate strategies that are part of the 21st-century skills. ENG511 Creative Writing 1: Poetry & Memoir This one-semester English elective helps you develop as a reader and writer of poetry and prose. The course covers the following genres: poetry, research, and memoir. The creative writing process of inventing, the process of making something new and different, something made up. But it also has solid roots in the real-world experiences and memories of the writer—fact, and fiction, blending together. ENG523 Myths & Legend Mythology and Legends is a one-semester course (0.5 English 4 or English Elective credit) designed to deepen your awareness, understanding, and appreciation of this literary genre while also using mythology as a source of inspiration for your own creativity. Your study of myths and legends will involve reading fascinating stories from ancient cultures through modern times. You will read, discuss and analyze these unique literary forms. ENG524 Contemporary Authors: Banned Books Contemporary Authors 1: Banned Books is a one-semester course (0.5 English 4 or English Elective credit). Why do we ban books? Sometimes fiction can be dangerous. Through novels and stories, we learn how the world works. Through fiction, you come to understand your own life and the lives of others. In this course, you will read 4 novels throughout the semester. Selecting from a list of previously banned books, we will investigate elements of fiction that unify the writers we study, as well as mark them as distinct and memorable. We will also consider why societies fear fiction and sometimes want to limit our access to books. ENG541/542 Cinema Visions Cinema Visions is a one-semester course (0.5 English 4 or English Elective credit) that allows students to explore film as literature and screenplay. Students will view, analyze, research, read and write about representative 20th-century films, starting with the silent era and end with contemporary productions. SOC101 iGeography In this semester-long course, students will study the essential elements of geography. Topics will include world religions and culture, political and economic systems, and human impact on the environment. Students will also learn essential social studies skills through fieldwork. Students who take this course will be better prepared for success in future Social Studies courses. SOC201/251 World History 201 In this year-long course you will discover that while historical events are unique, they often are driven by similar, repeated forces. In telling the history of our world, you should pay special attention to eight significant and recurring themes. These themes are presented to show that from America to Africa, to Asia, people are more alike than they realize. Throughout history, humans have confronted similar obstacles, have struggled to achieve similar goals, and continually strive to better themselves and the world around them. You will follow the centuries-long struggle for individual freedom. To help understand today’s world, we need to understand why democracy matters. We need to know how the idea of democracy has become a reality for so many people in the world, and a goal for others. ANY student enrolled in this course may select the Honors Distinction. In order to qualify for Honors Distinction and have it noted on the official transcript, a student MUST complete all the supplementary requirements in addition to all the regular course assignments. SOC202/252 World History 202 In this year-long course you will discover that while historical events are unique, they often are driven by similar, repeated forces. In telling the history of our world, you should pay special attention to eight significant and recurring themes. These themes are presented to show that from America to Africa, to Asia, people are more alike than they realize. Throughout history, humans have confronted similar obstacles, have struggled to achieve similar goals, and continually strive to better themselves and the world around them. You will follow the centuries-long struggle for individual freedom. To help understand today’s world, we need to understand why democracy matters. We need to know how the idea of democracy has become a reality for so many people in the world, and a goal for others. ANY student enrolled in this course may select the Honors Distinction. In order to qualify for Honors Distinction and have it noted on the official transcript, a student MUST complete all the supplementary requirements in addition to all the regular course assignments. SOC301/351 United States History 301 In this course, students will study the early/foundation documents, including the US Constitution and will learn how the system of checks and balances works. essential elements of geography. Topics will include slavery, the causes of the Civil War, westward expansion and life on the frontier, the beginning of industry, immigration and urbanization, political change in the progressive era and causes and involvement in World War I. Students will use US Supreme court cases as a way to student “themes” in units and see how the Constitution has helped us work through history and has been changed by us, through the amendment process, as times have changed. SOC302/352 United States History 302 In this course, students will study the rebuilding of the United States after the devastating Civil War, then learn about the amazing “Roaring 20’s” followed by the Great Depression and then WWII. The post-WWII era saw the United States emerge as a superpower and students will learn about the responsibility of superpower status and the build-up of the Cold War. The 1960’s saw the US increasingly involved in Vietnam and civil uprising across the country. In the early 1970’s we saw our first US President resign, deal with energy and economic issues and the 1980s saw a rebound in the economy and US pride, then the end of the Cold War as the Berlin Wall fell down in the late 1980’s. The 1990’s was impacted by technology and the booming economy, to be followed by terrorism and religious extremism in the 2000’s. This class covers one of the most interesting eras in human history and leads up to current times. The class is set up with many small quizzes and small writing assignments, the content is interesting. Come learn about the events that shaped our current world! SOC401 Washington State History In this course, students will study the great state of Washington, the Evergreen State! Students will learn about the forces that shaped our physical features, the early inhabitants of this area, Native American history and culture, and the European exploration to the Pacific Northwest. We will learn how new technology and industry shaped our state, study our past and current political systems and learn about industry and business in our state history. We will also learn about regionalism and the different issues facing various regions of our state. A final project has students plan out a future trip around Washington, taking advantage of all the great things to see and do in the Evergreen State! SOC501 Government In this course, students will study government in general, and different forms of government, worldwide. Students will learn how our democratic system works in the US and how the US Constitution is designed. Students will learn how the Electoral College works and is the system that elects the US President. Students will study the Bill of Rights and the other amendments and will study the design of our federal government. Students will learn how to contact elected officials and will contact a politician, and they usually get letters/emails back from the people they contact. Finally, students will study citizenship and responsibility in a democratic government. There is also a CBA that gives the student choice about topic, design and more. Come join us and learn all about Government! SOC411 Global Issues As current as the latest headlines, this class will explore world events and issues by looking for their causes and historical backgrounds. Students will study and analyze national changes, worldwide changes, trends, and predictions for the future. Information for classroom discussions will come from current publications (newspapers, magazines, and Internet). Students who enjoy politics, current events, debates, class discussions, and role-playing will enjoy this course. SOC610 Psychology As an introductory survey course, online Psychology will quickly cover all of the major study areas in the field of Psychology. We will look at all of the major individuals, studies, and theories in the area of psychology. MTH101 Algebra 1 101 Algebra 1 introduces students to algebra and illustrates its relevance in today’s world. Students evaluate expressions, graph and solve linear functions and inequalities, and learn problem-solving strategies. MTH102 Algebra 1 102 Students continue their progression through algebraic concepts, expanding their knowledge of functions and relations, simplifying rational and radical expressions, solving and graphing radical and quadratic equations and inequalities, and analyzing data and making predictions. Students are introduced to graphing calculators in this course. MTH201/251 Geometry 201 Geometry introduces students to geometry concepts, formulas, graphs, and equalities. Students construct geometric figures and solve related proof problems. The course emphasizes applied problem-solving and inductive and deductive reasoning. MTH202/252 Geometry 202 Students continue their progression through geometric concepts, figures, and shapes while studying similarity, area and volume, ratios and proportions, coordinate geometry, transformations, and vectors. MTH301/351 Algebra 2/Trigonometry 301 Algebra 2/Trigonometry provides a strong foundation from which students can continue on to trigonometry and calculus. Students study various types of functions and use factoring, matrices, and graphing to solve equations. MTH302/352 Algebra 2/Trigonometry 302 Students continue building a knowledge base for continuation on to calculus, trigonometry, chemistry, and physics. Students study rational, exponential, and logarithmic functions, and solve equations and use graphing calculators. Students also learn about exponential growth and decay, as well as conic sections and data analysis. MTH401 Pre-Calculus 401 Students explore algebraic concepts including inverse, exponential, and logarithmic functions, as well as conic sections, matrices, and determinants. They work with combinations, permutations, and probability, and use summation notation, sequences, and the binomial theorem to evaluate expressions. Students will identify, graph, analyze, and solve problems involving linear, quadratic, polynomial, and rational functions and inequalities. MTH402 Pre-Calculus 402 Students continue their preparation for calculus and college math courses as they review basic trigonometric concepts including approximate values, identities, logarithms, vectors, and polar coordinates. Students continue their preparation for calculus and college math courses as they earn college credit through Everett Community College (fee-based) while learning basic trigonometric concepts including approximate values, identities, logarithms, vectors, and polar coordinates. CTE110 Family Health You may or may not have thought much about your personal health. In this semester-long course, we will explore the components of health and focus on the areas that influence health the most. You’ll use videos, online research, and discussion to develop skills and practice techniques that will improve your health. PED111 PE 1 Online 111 In PE 1 Online 111, you will develop a personalized fitness plan focused on your personal goals and log activity for 8 weeks. But before you do that, you will dive into the benefits of exercise, medical background, the cardiovascular system and the importance of nutrition to fuel your body. This course will challenge you to improve your fitness and reflect on the changes you are making. Weekly and consistent logging is required. PED112 PE 1 Online 112 In PE 1 Online 112, you will develop a personalized fitness plan focused on your personal goals and log activity for 8-10 weeks. But before you do that, you will dive into the mechanics of muscles and flexibility. Additionally, you will work together with a group online to complete an ongoing project. This course will challenge you to improve your fitness. Weekly and consistent logging is required. PED201 Walk FITT 1 201 In Walk FITT 1 you will use your daily walking to achieve your fitness goals. After tracking your steps with a pedometer, you will develop a personalized walking plan focused on your personal goals and track your walking. But before you do that, you will dive into the benefits of walking, medical background, the cardiovascular system and the importance of nutrition to fuel your body. This course will challenge you to improve your fitness. Weekly and consistent tracking steps with a pedometer is required. PED202 Walk FITT 2 202 In Walk FITT 2, you will develop a personalized fitness plan based on the number of steps you take a day, focused on your personal goals and log activity for 8-10weeks. But before you do that, you will dive into the mechanics of muscles and flexibility. Additionally, you will work together with a group online to complete an ongoing project. This course will challenge you to improve your walk fitness. Tracking steps with a pedometer, weekly and consistent logging is required. (NOT in a sport) Students should be active in or train in some type of ACTIVITY. Students will research Nutrition, Safety, Careers, and Injuries specific to four different areas of focus (Flexibility, Cardio, Strength, and Power and Sports). Students will try activities in each of these 4 areas of fitness for one week each. Then they will create a Personal Fitness Plan based on what area or areas of fitness they want to focus on. (In a sport) Students should be active in or training, specifically for a sport during this class. Students will research Nutrition, Safety, Careers, and Injuries specific to their sport of focus. Students will also create an In Season and Out of Season fitness plan specific to performance in their sport. SCI201/251 Biology 201 In this course students will study the characteristics of living things and genetics. Students will participate in online group work and discuss scientific topics using the discussion board, online tutorials, videos, and games. SCI202/252 Biology 202 In this course students will study evolution, energy and matter and ecology. Students will discuss scientific topics using the discussion board, online tutorials, videos, and games. Students will demonstrate their learning with projects, tests, quizzes and real-life scenarios. SCI211 Oceanography In this semester-long course, you will research the most common problems in the ocean. As you research, we will discuss the concepts needed to understand each issue. To demonstrate your learning, you will blog, design a presentation or use other web2.0 tools. To apply your learning in the real world, you will find a cause to promote and dive into activism, but you will choose the issue and the side you will support. Some classes may be closed if there are insufficient enrollments. We try to keep enrollments at a minimum of twelve students to maximize the opportunities for interactions.